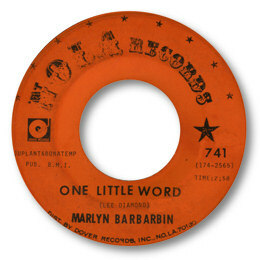 New Orleans lady Marilyn Barbarin’s first disc for Nola was the super deep ballad One Little Word for Nola. The structure of the song is first class as are the harmony background vocals. I’d bet the lovely horn arrangement was one of Wardell Q’s. 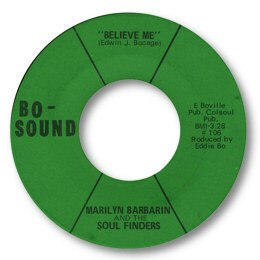 Funk fans go for the “Reborn” side of her Bo-Sound 45 but Believe Me is a much better song and allows Marilyn’s breathy tones plenty of room. The slightly jazzy feel to the chord changes are really nice too. Her rather discofied Virgil 45 “Make It Alone”/”Stop Before You Start” goes for very big money these days, the later 45 for Olympia from the 80s Will You Still Love Me is another fine disc – a strong midpaced rhythm and some super male background vocals. All Marilyn’s discs seem to be difficult to get hold of these days but there’s not a bad one amongst them. Judging by her appearances on some recent compilation CDs from the city she's still singing actively in the Crescent City. 1. 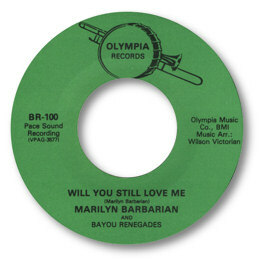 Marilyn has one track “Tell Me Why” on the Mardi Gras Records CD “New Orleans Jazz Gumbo : Jazz Blues & Gospel”, and four tracks on the “New Orleans Rhythm Conspiracy” CD – “In This World”, “Just Like That”, “Tell Us The Truth” and “Down To The Hole”. 2. "Believe Me" can be found on the Grapevine 2000 UK CD "Confessing" (GVCD 3028).